Our family just returned from a cruise on the Disney Fantasy where one of our ports of call was Disney’s private island Castaway Cay. My wife and I had been discussing the idea of running the Castaway Cay 5k. 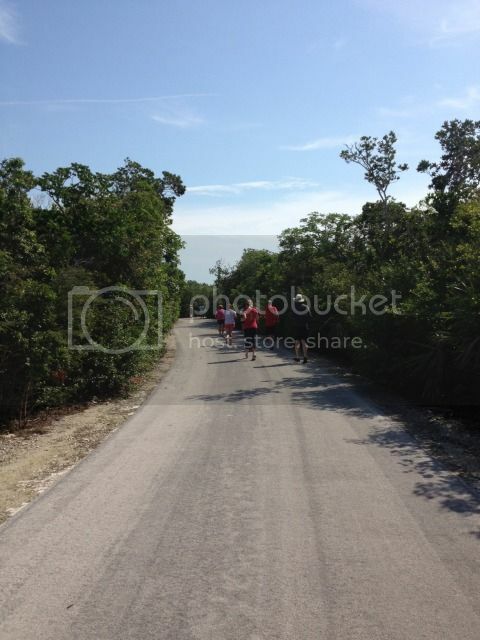 This is a scheduled run that takes place during most stops at Castaway Cay. Disney first started coordinating this 5k back in 2008. In fact, The DIS Unplugged posted a blog about it in July of 2009, but there have been a lot of changes and modifications to the run since then. To learn more about this great physical activity continue through the page break. One of the best aspects of a Disney Cruise Line vacation, or any cruise vacation for that matter is the food. Just about everywhere you turn on a cruise ship you can expect to come face to face with one, two, three, or all four of the major food groups. It’s good to know there are activities on a Disney Cruise Line vacation that can help reverse the trend of a food coma. If you pull out your navigator on your Castaway Cay day you’ll notice something you may not expect. A 5k run on Disney’s private island. As your Disney vessel pulls into Castaway Cay (usually around 8:00AM) you’ll want to be awake and moving around the ship or your cabin in preparation for the 5k. We were told to meet at O’Gills Pub at 9:00AM to check-in for the run. Run Disney sponsors and coordinates this event. They are careful to call it a run and not a race. The 5k is meant to be a leisurely activity and not a competitive race. As we walked into O’Gills Pub we were amazed at the number of cruisers who had decided to run with us. In total there were 94 runners. 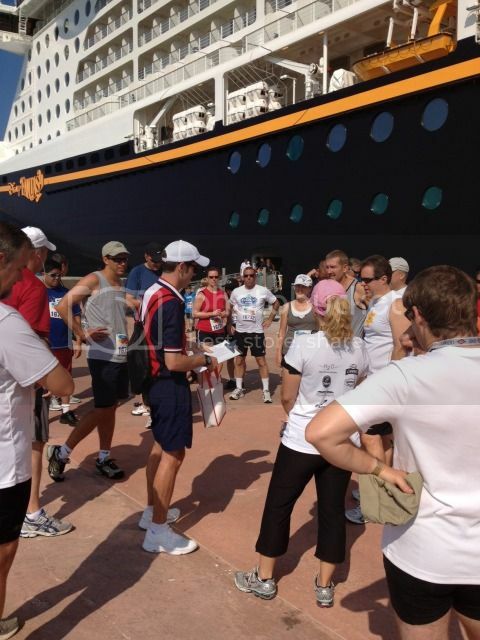 According to our coordinator our cruise had the 2nd most 5k runners of any cruise in the past. When we checked-in we were given a bib number and pins. There is no timing chip for this event. Because of the large number of runners the check-in process took much longer than expected. We did not leave the ship until 9:30AM. Since it was June in the Bahamas the heat of the day was already settling in. We were escorted through the midship gangway and onto Castaway Cay. The race starts near Pelican Point which is located past the family beach. The run starts here because the family beach walkway can get very crowded in the morning making it tough for runners to start or finish the race. You can walk to the start line or take the shuttle to the Pelican Point tram stop. Once we arrived we were greeted by our run coordinator who explained the course, water stops, signage, and timing situations. Once our lecture was complete all 94 of us toed the line and started the run. The course utilizes the air strip that leads island visitors to the Serenity Bay (the adult beach). Along the air strip we turn right onto a long circular bike trail. After we ran around the bike trail it was back on to the air strip towards Serenity Bay where we turned around at the famed abandoned airplane. The last half of the run utilizes the same circular bike trail, but this time we ran in the opposite direction. 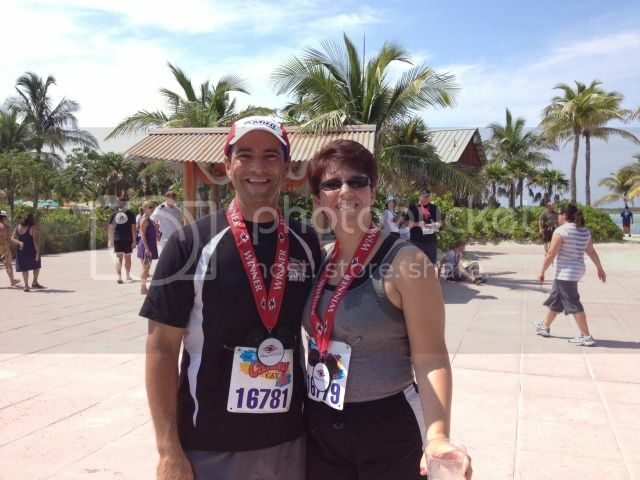 After exiting the bike trail we ran another 200 yards to the finish line (the same place the race started). Thankfully, the entire course is made up of asphalt and is flat. There’s no sand to run on or hills to conquer. The course is somewhat boring and scenic at times. 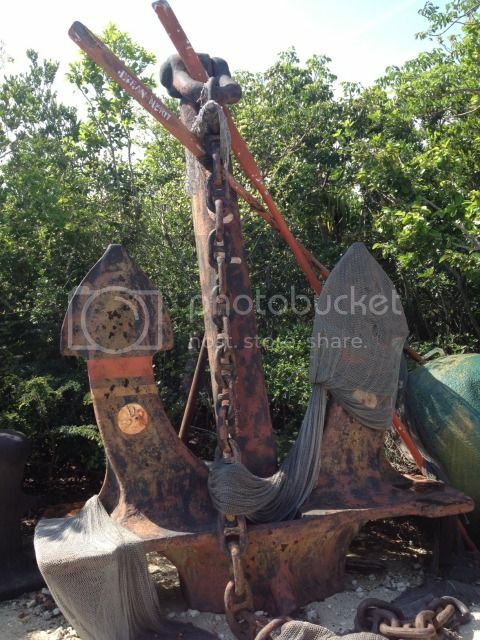 You get glimpses of island props like large rusty anchors and pirate materials used to captain a ship; however, a good chunk of the course is just greenery around you. After you finish your run you are presented with a Disney Cruise Line medal and your name is checked-off of a list to ensure you finished the race. There’s a digital clock at the finish line that displays your run time. 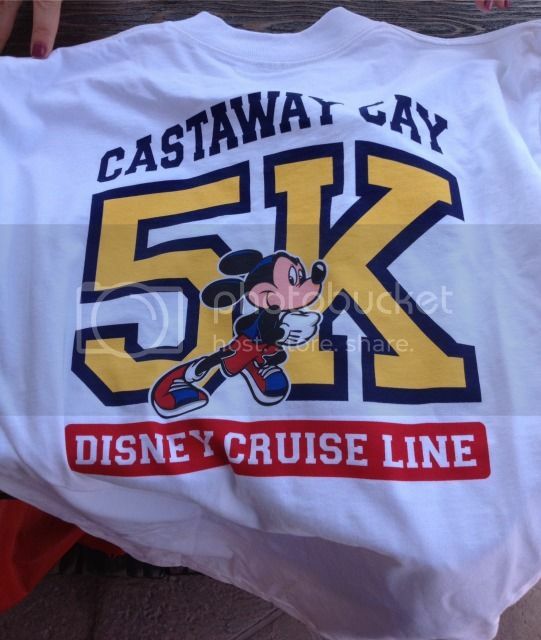 Additionally, the shop next to the finish line sells Castaway Cay 5K T-shirts which cost $21.95. Get one as quickly as possible because they do sell fast and sizes are limited. It’s a great way to commemorate your run on Disney’s private island. 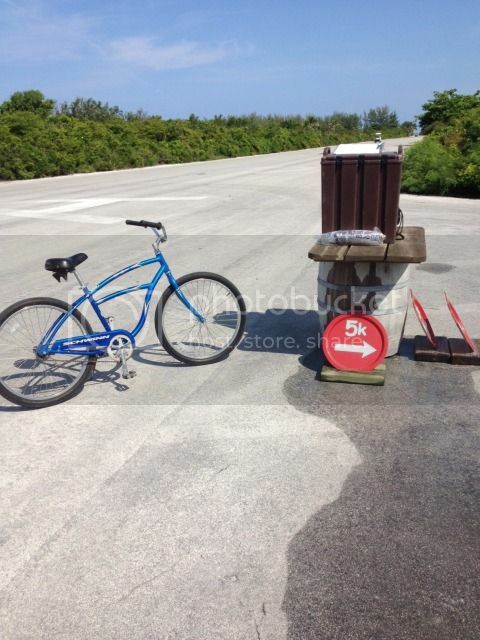 - Try and take everything you need for your day on Castaway Cay with you to avoid going back to the ship after the run. You may not finish the run until after 10:30AM so going back to the ship will cut into your beach and activity time. There are showers on the island for after the race. Bring a bag with a change of clothes and your beach essentials in it. 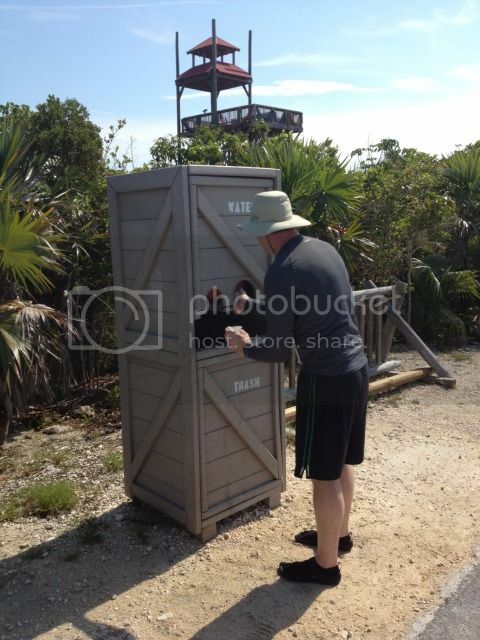 There are no lockers on Castaway Cay so if you have a trusted friend or family member who can watch your bag while you’re running that would be ideal. Otherwise, you’ll have to leave your belongings in an open box at the start/finish line. - On your way to Pelican Point to start the 5k you may have the opportunity to take pictures with characters depending on the lines. If you don’t get the opportunity to take character photos make sure to get them immediately after the run or else you may miss them all together. - It gets hot and humid on Castaway Cay. With the run starting just before 10:00AM you will feel the effects of the heat and humidity rather quickly. Make sure to go at a pace that’s suitable for you, but cautious at the same time. Heat exhaustion and dehydration can creep up on you before you know it. - Walking the Castaway 5k is perfectly acceptable. The coordinators leave the finish line 45 minutes after the start of the run. If you finish the run after the coordinators have left you will receive your medal at your stateroom later that evening. - There’s no additional cost for running the Castaway Cay 5k. It’s part of your general cruise activity lineup. - Children are encouraged to run the 5k. There have been reports of child restrictions of under 8, under 12, and even under 18, but I was told by our coordinator children under 16 just need to be supervised by an adult during the run. 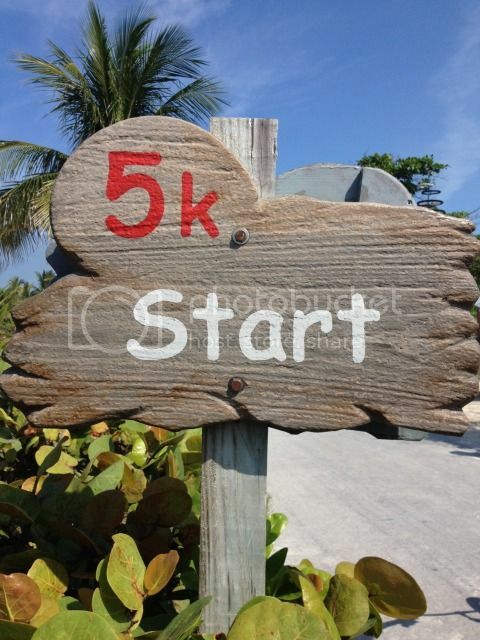 The Castaway Cay 5k is a lot of fun and can help make you feel less guilty about your food indulgences . It’s a great physical activity that can make your day on Castaway Cay more memorable. It’s even a great family activity if your spouse, son, daughter or relative want to run with you. Just remember to drink a lot of water along the course on those hot and humid days. If you are a fitness junkie, less than buff, or somewhere in the middle consider running the Castaway Cay 5k. If nothing else it will get you up and moving around the island, and you simply don’t want to miss everything there is to see on Castaway Cay. It’s a tropical island paradise.